Immunohistochemistry analysis in formalin fixed and paraffin embedded human skeletal muscle reacted with ORMDL2 Antibody (Center) Cat.-No AP53121PU-N peroxidase conjugated to the secondary antibody andf ollowed by DAB staining. 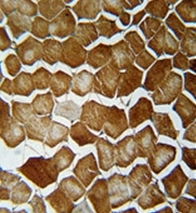 This data demonstrates the use of the ORMDL2 Antibody (Center) for immunohistochemistry. Clinical relevance has not been evaluated. Western blot analysis of ORMDL2 Antibody (Center) Cat.-No AP53121PU-N in mouse stomach tissue lysates (35ug/lane). This demonstrates the ORML2 antibody detected the ORMDL2 protein (arrow).